Congratulations to Leo Ostenrath for winning his first Fight Night Combat tournament at the Herfst Jongleer Weekend 2016 in the Netherlands. 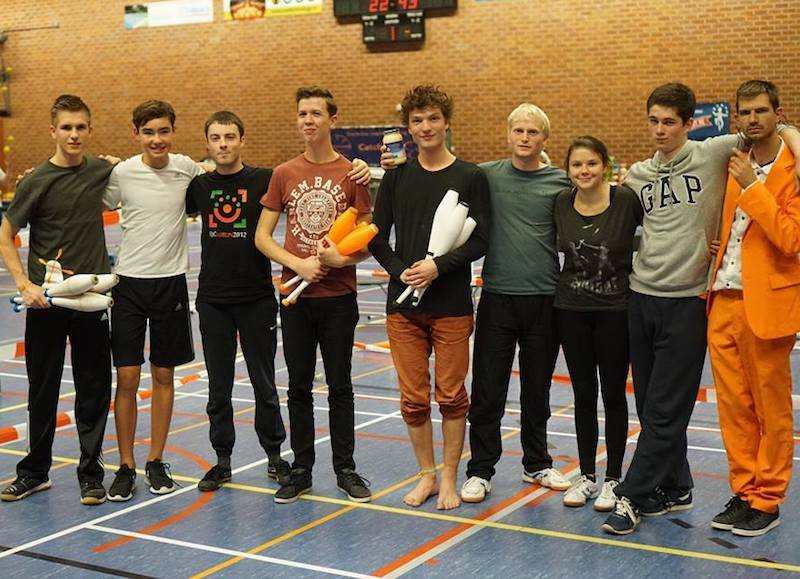 He beat current top-ranked Dutch juggler Rob van Heijst 5-0 in a very one-sided final and earned himself 350 ranking points. This bumps Leo up to 11th in the 52 week current rankings, and into the top 10 in the 2016 Race Rankings. If HJW had been the only combat tournament this weekend, he'd be the next in line for an invite to the European Masters end-of-year finals in Berlin at the end of November. But Dublin University also hosted the Dublin Freshers Juggling Convention Fight Night, a brand new juggling event in Ireland. Only nine jugglers entered the tournament, so only rankings 200 points were on offer, but by winning Danny Cooper jumps up one place above Leo in the Race Rankings. Danny adds those points to those he earned by winning a tournament in Germany this summer (CoastCon 2016) and making the quarterfinals of the EJC 2016 Almere Fight Night. His 1000 points in 2016 put him just slightly ahead of Leo's 947. While both Danny and Leo look likely to qualify for the European Masters, Jan Poolen's position is more tenuous. His third place at HJW means he's currently 9th on the provisional invite list with three tournaments still to go. While Leo, a German, won in the Netherlands on Saturday, Jan will be returning to ZirkuLaer in Germany in a few weeks time, a tournament he won last year. A strong result there should secure his invite, making him the second Dutch juggler at the tournament (after Rob van Heijst). Thanks to Leanne Staugaard, Melissa Staugaard, Maarten Wils and Dave Leahy for running the HJW Fight Night and Danny Cooper and Des Johnston for running the Dublin Freshers Fight Night.